This might primarily be a blog about books, but when you have a platform, no matter how big or how small, I think it's important to highlight other issues when you can. That's what I'm doing today. The Prince's Trust is celebrating its 40th birthday, but it's not all cake, balloons and presents. 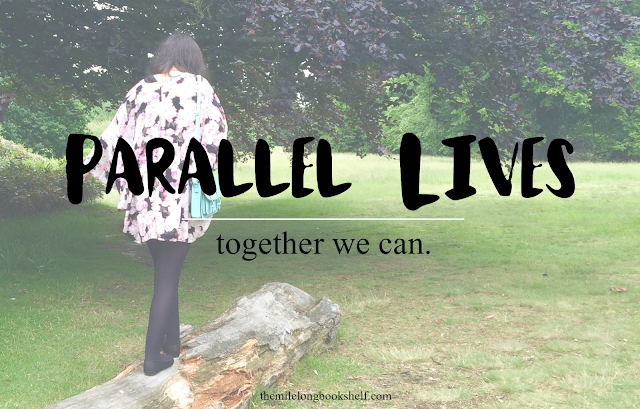 Instead, they've launched a new campaign called Parallel Lives to show the future some of the young people they support could have had if they'd been left to battle the world on their own. The video was first brought to my attention in an email, and I watched it for a second time when it appeared before a film (Ghostbusters, if you're wondering) at the cinema. I was there with four friends, and we'd been chatting between ourselves, getting comfy, snacking... and the video silenced not only us, but the entire cinema, which was obviously packed because, hello, Ghostbusters. It's an incredibly powerful video. This time last year, I was stuck. I wanted to continue my education and do A Levels, but we couldn't afford it. Luckily, I'm part of a hugely supportive and wonderful community of people, and together, you changed my path in life. That's what The Prince's Trust is doing, too; they work to rehabilitate young lives, and help them get in to higher education, the workplace, and further. Like you did for me, they work to change young people's life paths. I didn't know about this until that video popped into my inbox. Now I know that #TogetherWeCan save young lives and change people's paths, by spreading the word and helping out in any way we can when people are stuck and struggling to get to where they want to be. It might sound like it, but this isn't sponsored. A PR company sent me this video and asked if I could blog about it, and I'm always happy to do my bit for charity, so I said yes. Also, the PR company aren't getting paid to work on this campaign either - they're giving up their time voluntarily. How cool? I watched this 3 times because of how breath-taking it is. But not breath-taking in a good way, more breath-taking as in, that could be me. I'm fortunate with my life and I know I don't spare enough thought for people who are less fortunate. I know I should. It's easy to forget that other people don't have the same life and I want to make sure I don't forget and try to help somehow. Thank you for sharing this. Thank YOU for such a great comment! I want to try and help too, but not sure how. I want to go further than this blog post.